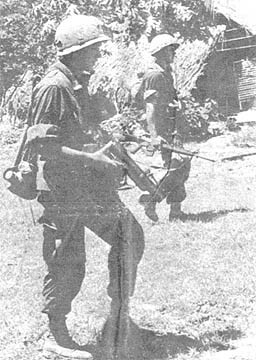 A Viet Cong rallier to the Government side recently led soldiers of the 1st Bn., 27th Inf "Wolfhounds," to twelve arms and ammunition.caches in two days of the 2nd Bde Operation "Kolekole." The finds were made in the swampy lowlands between Duc Hoa and the Oriental River. The rallier claimed he was a member of a local Viet Cong guerrilla unit. He had given himself up to Vietnamese officials at Duc Hoa earlier in the week. MAJ Lynn Steversen, brigade intelligence officer, said that the losses to the Viet Cong were critical and would be difficult to recoup. "The conditions in the monsoon season will make replacement of captured material extremely difficult for the enemy," he said. The first day Co B accompanied the rallier as he pointed out five caches. They included: 8000 rounds of small arms ammunition, 60 Chinese hand grenades, 32 rifle grenades, claymore mines, sub-machineguns, and 14 rounds of RPG-2 anti-tank ammunition. Through an interpreter, the rallier explained the usual method local Viet Cong concealed their weapons. Though brigade officers did not release details on the guerrilla technique, they did reveal that the following day a U.S. unit using the method uncovered a cache of five PRC-10 military radios near the Oriental River. The same day, the rallier led Co C of the Wolfhound battalion to seven more concealed storage sites. These included four rifles, one Browning Automatic Rifle, one complete 60mm mortar, 112 hand grenades, 76 rifle grenades, and a case of blasting caps. In one 55 gal. drum the company found 45 sets of black pajamas, 60 hammocks made from sandbags, and 500 feet of electrical wire. During the same period, brigade units destroyed 32 bunkers, seven punji pits, six tunnels, and one unusable 20mm anti-aircraft cannon. The action took place as part of Operation Kolekole, the 2nd Bde's portion of the 25th Div's monsoon campaign. A 2nd Bde unit taking part in Operation "Kolekole" recently killed 11 Viet Cong and supporting gunships killed 12 in an action west of Duc Hoa. Many of the enemy were so heavily camouflaged that soldiers of Co A, 1st Bn, 27th Inf "Wolfhounds," described them as walking bushes. The unit was moving through the swampy lowlands near the Oriental River when the first contact was made. "I was acting as point man," said PFC Ronald Whited of Monroe, Mich., "when I spotted three bushes about 150 meters ahead that looked as if they were moving toward me." Whited signaled the rest of the company and they quietly fell to protective firing positions. The enemy moved to within 50 meters of the hidden soldiers when they began firing. The company, led by CPT Leonard Marcum of Lansing. Mich., returned fire and began assaulting the enemy. "It was just like a charge you see on television," said Whited. Three Viet Cong were killed immediately, and their weapons were captured. 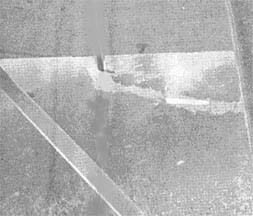 More camouflaged enemy were spotted from the air by Battalion Commander LTC Harvey Perritt. 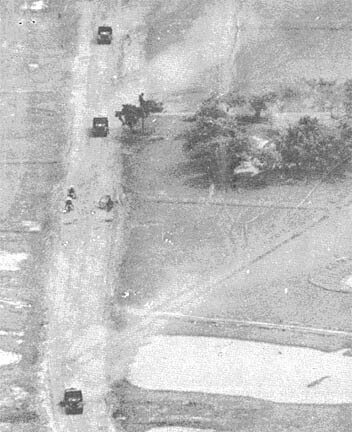 Elements of the 2nd Bn, 27th Inf., were airlifted into blocking positions behind them and Co A continued their sweep forward. Supporting helicopter gunships were called into the fight in support of the "Wolfhound" units. In the action that followed, Co A killed eight more, and captured two M-1 carbines. 150 rounds of small arms ammunition and two sets of web gear. "We took them completely by surprise at first," said Marcum, "everyone including the gunships did an outstanding job. Even the artillery killed one VC without a shell being fired." He referred to SGT James Allgood of Forest, Miss., the unit's artillery forward observer. Allgood spotted a VC fleeing the battle site and killed him with a round from his rifle. The enemy soldier was armed with a Chinese assault rifle. The flight control chief on duty at the 25th Avn Bn checks his flight control board and discovers a helicopter pilot is late in reaching Saigon. Immediately he tries to reach the pilot by radio, but no answer. Quickly he radios the other pilots in flight to see if they can reach him, but no luck. Maybe he hasn't left Cu Chi. The chief makes a ramp check. The word comes back that the pilot did leave. The chief then radios Saigon, maybe due to a shift change the report of the pilot's arrival was not made. But again no luck. Saigon reports that the pilot has not landed. The next move the chief makes is to call the artillery advisory control stations along the pilot's flight route. On each flight the pilot must radio ahead to each station to insure that the artillery in the area is not firing so it is safe to pass over. By radioing each one of these, the control chief will be able to determine which station the pilot last radioed. One by one the chief checks, finally he discovers that station number three has not heard from the pilot. Something obviously has happened to the pilot between station two and three. The control chief checks air strips in that area to see if the pilot was forced to land. The helicopter must be down between stations two and three. Quickly the chief checks to see if any helicopters are left on the ground to start a search and rescue mission, but none are left. He checks his flight board and radios to pilots who are on routine missions to start the search and rescue mission. This is a fictitious situation, but the procedure is factual, and in a real emergency the flight control chief of the 25th Avn Bn, 25th Inf Div, can initiate a search and rescue mission in less than thirty minutes. Operation "Barking Sands" ranges from civic action to fierce fighting for elements of the 1st Bde. 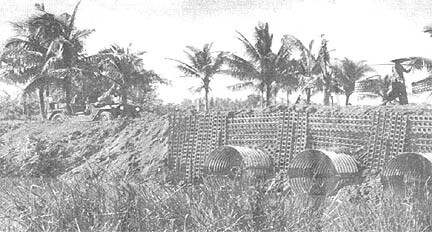 The monsoon offensive was launched May 15. According to brigade commander COL Doniphan Carter, of Annidale, Va., the overall objective of Barking Sands is, "to assist the Government (GVN) forces in gaining the confidence and support of the local population. We are also assisting in providing security and control for the Vietnamese people in order to separate them physically and psychologically from the Viet Cong military and political structure." Carter added, "We are seeking to accomplish this by working closely with the Government forces in flushing out and destroying the Viet Cong. We are also supporting the GVN Revolutionary Development program." The 1st Bde uses varied techniques, constantly looking for new ideas. The pacification procedure presently includes seal and searches, ambushes, psychological warfare projects and civil affair projects. These projects include MEDCAPS, Helping Hand projects and aiding displaced personnel. Food, clothing and other articles are distributed to the people. The efforts of the Psychological and Civic Action teams have destroyed the VC infrastructure in populated areas and the enemy's will to resist. Civic Action sways the Vietnamese people away from the Viet Cong. A MEDCAP's humane care of the sick and wounded is far more effective in gaining the support of Vietnamese villagers than the VC tax collectors and terrorists. There has been a particularly high number of Viet Cong killed. 34 by actual body count and 35 possible. Another impressive figure in operation Barking Sands is the number of caches discovered. The never ending work of the infantryman has uncovered 130 punji pits, 17 small arms, three machine guns, three recoilless rifles, 38 mortar rounds, and 2656 rounds of small arms ammunition. The list continues with 67 anti-tank mines, 37 anti-personnel mines, 210 hand grenades, and 178 booby traps. The men also confiscated 975 lbs of rice, 20 lbs of VC medical supplies, 16 lbs of documents. 29 lbs of clothing, 18 sampans and 2 bicycles. The Hoi Chanh who have turned themselves in have led the allies to VC hideouts complete with equipment, food and more VC. One Hoi Chanh has been most helpful in providing the allies with information on troop concentrations, supply trails and other data that has proven surprisingly reliable. Air strikes have been a dominating feature in the operation. Signs of the destruction and harassment caused by the air strikes are most evident by the remains of 65 VC killed by the strikes and the terror expressed by surviving VC. Artillery can claim much of this destruction and the VC complain of its effectiveness. Several successful RAG boat operations have taken place and one unit has discovered huge VC tunnel complexes. The RAG boats are very effective in patrolling shores and allowing our troops another avenue of attack. This allows a blocking force to be situated along favorite VC retreat paths. Operation Barking Sands hits the enemy from all angles. The VC are losing ground in combat, losing irreplaceable supplies and are further undermined by our winning the Vietnamese people to the Government side. SP4 Thomas L. Hayden, Co. A, 1st Bn (Mech), 5th Inf'. Washington (ANF) - Chief of Staff GEN Harold K. Johnson has approved a liberalized promotion policy in US Army, Vietnam, to permit accelerated promotions to the grade of E-4, E-5 and E-6. The new policy, based on recommendations from a Department of the Army personnel survey team in Vietnam, was approved May 23 for the remainder of May and the month of June. The survey team recommended that DA take action to improve the promotion situation for enlisted men in Vietnam, pending a full analysis of all the recommendations by the team. The team returned from Vietnam on June 1. No limitation will be placed by DA on the number of in-country promotions an enlisted man serving in USARV can receive if otherwise qualified. Up to five percent of the authorized strength in USARV, up to three percent of the authorized E-5 strength, and up to two percent of the authorized E-6 strength may be promoted from the grade below without regard to time-in-grade and time-in-service criteria. The survey team found the old system did not permit sufficient latitude for the promotion of outstanding personnel. "It's up to every American to fight for the freedom we hold so dear. If we don't, the smells of free air could become dark and damp as in a prison cell." This was written in a letter by Army PFC Hiram D. Strickland last year which won the George Washington Award from the Freedoms Foundation. PFC Strickland never received the award. It was presented to his family because he was killed in Vietnam defending the freedoms he held so dear. This freedom for which so many have sacrificed their lives on the battlefields of the world is the basis for the 1967 Freedoms Foundation Awards Program. This year's subject is, "Freedom: My Heritage, My Responsibility." Every serviceman and woman on active duty is eligible to submit as many entries as he may desire. Each entry may be in the form of a letter, essay or poem of not less than 100 nor more than 500 words in length. Entries must be sent to Freedoms Foundation, Valley Forge, Pa., 19481, prior to Nov. 1, 1967. Members of the Armed Forces may also compete for the other Freedoms Foundation awards offered. Dependents of service members, who are not eligible to enter the Letter Awards Program, may compete for awards in other categories. Additional information on the Freedoms Foundation Awards Program, may be obtained by writing to Freedoms Foundation, Valley Forge, Pa., 19481. When you submit your entry, be sure to include your full name, rank, service number, branch of service, organization, and home state address. Two Viet Cong guerillas tried to join the ranks of a 25th Inf Div night patrol and failed because they weren't "standing tall." As the 1st Bn, 27th Inf, patrol was setting up firing positions, SSG Henry Ward of Mt. Pleasant, S.C., noticed two men, wearing steel helmets and field gear, walking around apparently doing nothing. "I called to them," Ward relates, "but all I got back was a mumbled answer. Then I realized that I didn't have anyone in the squad that short so I ordered them to halt." The two broke and ran in opposite directions . . . one escaped but the other was killed by a M-60 gunner. When you head back to the states, among the other things you have to do, make sure you obtain some Department of Defense Forms 1580. That is the Military Standby Authorization for Commercial Air Traffic. You MUST have this form if you want to fly half-price standby in the states now. You should have AT LEAST five copies. Also, make sure they have been properly signed. Many men wind up at the airport with a place to go but no way to get there standby because they either didn't get DD Form 1580 or didn't get it signed properly. As the children laughed and the parents smiled and accepted the medicine and soap, the cameras of a special Department of the Army photographic detachment whirred. The "set" was the village of Bau Tram. The main "actors" were the villagers with supportting roles played by the men of 2nd Bn, 14th Inf. The plot was MEDCAP and the 25th Inf Div band played on. The team, headed by "director" 2LT Richard Griffith of Columbus, Ohio, works out of Ft. Shafter, Hawaii. Its mission is to provide motion picture and still coverage of all Army activities in Vietnam. The sets range from a village to the field and the plot goes from a hot firefight to interviews. Many times the director has no control over the action, but the show must go on. The six man team spent more than a week with the 25th Inf Div recording activities of the Tropic Lightning men. The films are to be used at the staff level for evaluation of field activities and for briefings. Tran Thi Goi and Nguyen Van Tao are two small Vietnamese children who had been virtually blind for years. Both had glaucoma, an eye disease that not only caused pain, but also detracted from their appearance. Now, thanks to two soldiers, and the 12th Evac Hosp of the 25th Inf Div, the youngsters' pain has been relieved and the disfiguring and sightless eyes are soon to be replaced by artificial ones. 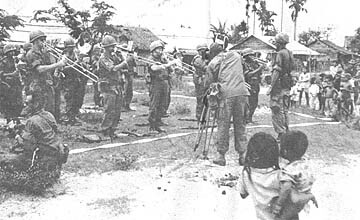 The children, Goi, 12, a girl, and Tao, 10, a boy, were brought to a 2nd Bn, 14th.Inf, MEDCAP held at Ap Hoi Tham 30 kms northwest of Saigon by their parents, who at the time were only seeking some way to relieve the children's pain. SP6 Blythe Tomlin, Franklin, Tenn., and PFC Raymond Weber, Jersey City, N.J., took an interest in the youngsters' case, and directed them to the MEDCAP doctor, who recommended the children be taken to the hospital for the delicate operations they needed. The opthalmologist, CPT Roland Houle, Boston, Mass., felt the operations were necessary not only to relieve the pain, but also to prevent the possibility of tumors. The right eye of each child was to be removed. However, the parents could not afford the artificial eyes to take their place. Tomlin and Weber offered to donate the necessary funds. On the 23rd of June, Houle performed the operations, and said the artificial eyes would be inserted in about six weeks. Further operations on the remaining eyes will be necessary only if their condition worsens, which is not expected in the near future. Tao can see sunlight with his left eye and Goi has 50 percent vision in hers. Unfortunately, extensive nerve damage prevented a cornea transplant on their remaining eyes. Ward nurse CPT Ellen Langston, Laconia, N.H., said, "the children are doing fine, behaving well, and even playing a little. Their parents visit them every day and have expressed gratitude for the compassionate Americans who have made all this possible." The sampan glided silently down the canal, its occupants searching the banks for enemy activity. Suddenly the men in the boat opened fire on a soldier standing near the shore. The Viet Cong guerrilla fell dead, another victim of "Phillip's Navy." For some time Co C, 2nd Bn, 14th Inf, has been assembling a small fleet of rubber boats and sampans. Some were acquired from Special Forces; others were captured from the VC. Co C has been using their "navy" to patrol the many small canals and waterways along the Saigon River during Operation "Barking Sands." CPT Frederick C. Phillips, Hot Springs, S. D., commanding officer, says the boats enable his men to move quietly and unexpectedly through VC territory, and this approach often gives them the element of surprise so necessary in anti-guerrilla warfare. The first RPG-2 round fell fifteen meters short of its mark. Platoon leader 2LT Charles Johnson ordered a right flank and assault. The second round struck the engine compartment of the "command track." As the crew was evacuating the vehicle a grenade landed and exploded on the open hatch cover. An element of the 3rd Sqdn, 4th Cav, was making a sweep of a woodline in Binh Duong Province at the southern edge of the Thanh Dien Preserve 20 kms northeast of Cu Chi while on the 25th Inf Div's Operation "Barking Sands." LTC John M. Shea of North Springfield, Va., the squadron commander, was riding on Johnson's armored personnel carrier at the time of the action. Shea, armed with a .45 caliber pistol, dismounted and ran toward the hole from which the grenade had been thrown. At the same time PSG Edward T. Gannon of Columbus, Ga., was moving toward the enemy position. Shea crouched and fired when a head appeared above the rim of the hole. After throwing his only grenade into the hole, Shea returned to the APC and grabbed an M-79 grenade launcher. Cannon in the meantime had also thrown a grenade into the hole. Shea fired a rifle grenade into the woodline and then emptied an M-16, found on the APC, into the enemy position. Eight of the nine persons riding in the vehicle were wounded; only Shea escaped injury. The eight-man outpost from Co A, 1st Bn, 27th Inf "Wolfhounds," spotted movement to their front soon after they took up their night position. Intelligence reports had indicated that there was a Viet Cong unit in the area. SP4 Michael Donohue of Salt Lake City was the first to notice the movement. "We were with half the men on watch and half asleep. I spotted what looked like heads bobbing up and down just as we were changing over. "The whole area was crisscrossed with rice paddy dikes, perfect for the VC to sneak up on us," he said. After that, no one slept. The movement was reported and the men were told to keep watching, but not to fire unless attacked. After a long nervous night, the tired soldiers moved cautiously ahead. They found them behind a dike about 75 meters from their position. "We sort of hate to admit it," said Donohue, "but it was a whole flock of ducks moving back and forth along the dike." The pressure off, the eight men walked back to the battalion base laughing, but sure that it was better to be safe than sorry. Chaplain (Maj) James Peterman of Wilmington, Del., and his assistant, SP4 Joseph Zapata of Brooklyn, N.Y., bring religious services to soldiers of the 2nd Bn., 14th Inf., wherever they may be. Accoutrements are either in short supply or nonexistent; altars and any other essential trappings are necessarily makeshift. Traveling by helicopter, supply convoy, or on foot, Chaplain Peterman manages to be where the troops are to provide moral and spiritual guidance. Duc Hoa and Bao Trai are the two most important villages in Hau Nghia Province. The first is the home of the 25th ARVN Div and the second is the Province capital. For nearly ten years, Viet Cong mines and trenches have made the road between them impassable. The bridge over a large stream just north of Duc Hoa had been blown by VC terrorists. Now all that is in the past and civilian and military vehicles travel the route between the two villages regularly. The change, so critical to the economy and defense of the heavily populated area, was brought about by elements of the 2nd Bde, 25th Inf Div, as part of its Operation "Kolekole." Kolekole is part of the 25th Div monsoon campaign. One of its primary objectives, beside destruction of Viet Cong forces, is reconstruction of major roads in the area. The Duc Hoa-Bao Trai road was a road in name only. It bore more resemblance to an obstacle course with trenches and mine craters that made even foot traffic difficult. The task of changing it fell to the 65th Engr Bn. The unit's Co A began reconstruction at the north end and Co B started from the south. The challenge given to units was to finish the project, bridge and all, in two weeks. The engineers trucked in gravel and laterite, filled the trenches, graded them over and covered it all with a special water repellent chemical. "Bravo" company attacked the problem of the blown bridge with a gravel base, and a final fill of reinforced gravel and laterite. The two companies caught sight of each other on the 12th day and finished the job on the 14th day, just as planned. "The engineers were magnificent," said COL Marvin D. Fuller, commander of the 2nd Bde. The brigade's 1st Bn (Mech), 5th Inf, provided most of the security protection for the construction crews. At a special ceremony held at the junction point of the road, MG John C. F. Tillson III, told the hundreds of onlookers that this cooperative effort between the Government of Vietnam and the 25th Inf Div would have a profound effect on all their lives by increasing the security of the area and allowing freer travel to area markets. 'This new bridge spanned one of the major holes in the road. It is capable of handling any vehicle. The culvert allows the stream to flow through without eroding the road. 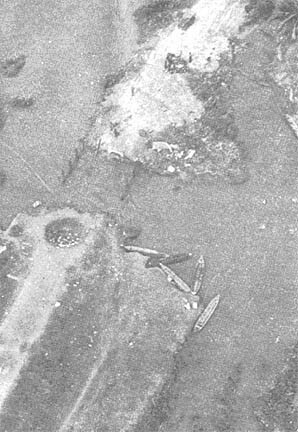 Sampans were the only way across the bridge site blasted by Viet Cong terrorists. 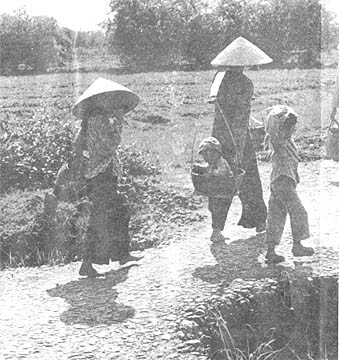 A family of Vietnamese walk past a few of the hundreds of trenches dug by the Viet Cong to destroy the road. 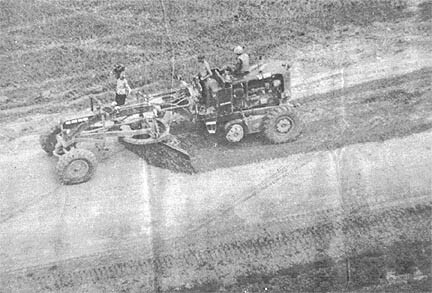 The road surface is smoothed by engineer graders after the trenches and mine holes had been filled in. 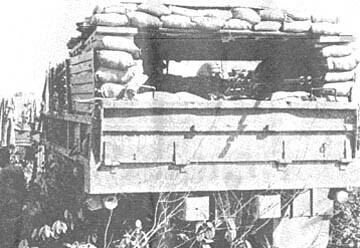 Trucks make use of the early sections of the road to haul in gravel for the bridge site. Four days earlier this section was impassable to all but foot traffic. CPT Don Harmon of Ochopee, Fla. packed himself, medical supplies, clothing and a doctor-medic team into two tiny boats and headed across the muddy Oriental River. He was about to bring medical care to a hamlet that hadn't seen a doctor in nearly a year. Harmon is Civil Affairs officer of the 1st Bn, 27th Inf "Wolfhounds," part of the 25th Inf Div's 2nd Bde. "There were no US troops operating in the area but we felt the need was great enough to make the trip," said Harmon. Villagers welcomed the three-man team as they pulled into the far shore. Battalion surgeon CPT Ted Ammel set up his medical station while Harmon distributed clothing, soap, and magazines explaining the Allied cause and showing the latest in US-ARVN cooperative projects. By late afternoon the team had treated 85 patients. As they packed their medical gear back into the boats and pushed away from the shore, many of the villagers waved them off. "Civil Affairs work, especially MEDCAP, is very rewarding," said Harmon, "our only regret is that we can't visit hamlets like this one more often." It may be that wars are won with weapons; friends are not. The "Helping Hand" extended to the people of South Vietnam by the people of Hawaii through the 25th Inf Div is winning Asian friends for America. "Tropic Lightning Helping Hand" is the name of the program begun in Hawaii in January of 1966. Support for the program, which is administered by the G-5, or Civil Affairs section of the division, was immediate and encouraging. Governor John A. Burns met with MG Fred C. Weyand, then commanding ganeral of the 25th Inf Div, to lend his full cooperation and support. The Boy Scouts of America and the Aloha Council reached out their hands also. And, most importantly, the people of Hawaii were quite generous. Donated materials (as well as those garnered from captured Viet Cong caches) are stored at and distributed from the 25th base camp at Cu Chi. A handful of soldiers from the division's G-5 section, along with a number of Vietnamese workers, built the storage areas and daily prepare the boxes (kits) to be distributed by units participating in the Medical Civic Action Program (MEDCAP) or on military operations. The basic kits include a refugee kit for families (a rice cooker, fry pan, soup base, two water buckets, and cooking utensils), woodworking kit (rip saw, cross cut saw, large claw hammer, plane, chisels, drill bits and drill), school kit (notebooks, pencils, ruler, pens, chalk, erasers, slates, and a plastic carrying bag), and a condolence kit (articles of clothing, toys, shower shoes, bag of rice, health and sanitation items, canned goods, and a leaflet explaining how to cook American food). Money was also donated during the Helping Hand Campaign in Hawaii and has been used to supplement the kits. MAJ Loiuis S. Jennings, assistant G-5 officer, says the program has difficulty in obtaining some items. Among these are school items such as scissors, rulers, and slates; athletic equipment; and toothbrushes toothpaste, towels, and soap (hotel-size). Hand tools are also in short supply. On a typical combined MEDCAP and civic actions mission the much-needed items are distributed in one of two manners. The material is either handed over to the village chief or distributed through a series of stations located near the village. In the latter instance the families file by to receive their allotted portions. The civic actions group, which works in conjunction with the village chief, is preceded through the village by an ARVN psychological welfare team which explains what is about to happen; the Vietnamese soldiers also cite the advantages of the Chieu Hoi Program. More than 170,000 people have been reached by Helping Hand to date. One thousand MEDCAPs have treated in excess of 106,000 patients. How would you like a ten day R&R with free hotel, food, gifts, and as much publicity as a movie star? That's just what happened to SP4 Keith R. Hadfield, a former machinegunner turned awards clerk, from Co A, 2nd Bn, 27th Inf "Wolfhounds." Hadfield was the 250,000th Vietnam assigned military man to go through the R&R program. Vietnam newspapers had been describing the fabulous time awaiting the "Quarter Million" mark passenger for weeks, but Hadfield hadn't noticed. "When I arrived at the R&R processing center they told us that someone on our plane was going to be the one, and that's the first I heard about it," he said. "We all went to get haircuts and shoeshines to be ready for the big celebration. All the time they were telling us all the things the lucky man would receive." When the group arrived at the airport, they were formed in a big semicircle with an R&R official at a microphone in the center. Movie cameras and press photographers crowded the area. The official, an Army colonel, welcomed the men and began reading off information about the winner. "After he mentioned that he was 175 lbs, a SP4, and from Illinois, I started to get a little nervous. When he called my name all the cameras swung around on me, and my knees just about buckled. I even forgot to salute the colonel I was so nervous." The ceremony was the beginning of a whirlwind five day escorted tour through Bangkok, Thailand. "Everywhere I went there were cameramen and reporters," he said, "it was an exciting schedule." Hadfield received gifts of everything from expensive dancing Thai dolls to a 144-piece bronze tableware setting. "It was hard to believe it was all happening to me," he said. "This is the sort of thing I always, thought happened to someone else." After the first five hectic days the newsmen all left, and he was given another five days to recuperate on his own. At the end of the ten days he packed his bags and returned to Cu Chi, minus all the fanfare. Hadfield is now back on his job at "Alpha" company, and just like any other G.I. he wishes he were back on R&R. A squad of Viet Cong "guests" attended a pre-graduation exercise at the 25th Inf Div four-day ambush and jungle tactics course. An ambush patrol is the last phase of the course for the men before returning to their units. 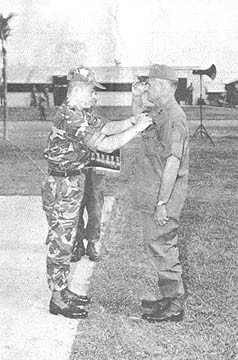 Second Lieutenant Aubrey Stacy of Melvere, Ark., was leading an 18-man patrol from an open field onto a road through a wooded area when the rear security guard spotted two Viet Cong moving around behind them. Seconds later an enemy squad hit the patrol with grenades and automatic rifle fire. Stacy immediately set his patrol up in a triangle and returned the fire into the enemy position. The patrol then moved 50 meters off the road and SFC Joseph Newton of Oneida, N.Y., radioed for 105mm artillery fire. After the Viet Cong withdrew, Stacy moved the patrol back through the woods. On the way back the patrol encountered several boobytrap wires set at chest height. 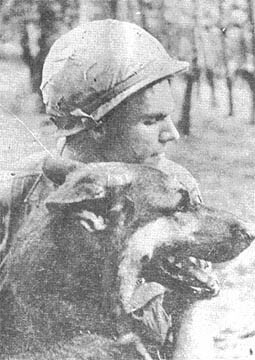 A 1st Bde Foward Air Controller (FAC) "Bird Dog" directed an air attack on at least 14 VC in mud near the Ho Bo Woods, 20 kms northwest of Cu Chi. Five VC were attempting to free a cart from the deep mud of a bomb crater when a Bird Dog, piloted by MAJ Bogue Harrison of Downs, Kans., took notice of their activity. Harrison said, "I spotted the cart with an 82mm mortar tube, tripod, and the works from 500 feet with binoculars. I received fire almost immediately and the VC did not run as they usually do when they see a FAC. In fact, nine more VC scurried to aid the cart pushers but apparently to no avail. By this time two gunships from the 25th Inf Div base camp saturated the area with M-60 machinegun and rocket fire, chalking up several enemy casualties. The VC returned the fire vigorously again, nicking one of the gunships. As the enemy was attempting to drag his wounded away, four F-100's from Tan Son Nhut AFB laid several 750 pounds bombs on the position, the finishing touches to a near perfect air assault. The jets also received fire, but no damage to the F-100's was reported. With the cart still stuck in the muck the Americans netted four VC dead by body count and the remaining VC were listed as possibles. To the men of Co A, 2nd Bn, 27th Inf "Wolfhounds," acting SGT Victor Padilla is like a one man squad. Padilla has accounted for six of the company's last ten Viet Cong. The 2nd Bde soldier accomplished the feat in a three week period of Operation "Kolekole" southwest of the Cu Chi base camp. On May 30th, Co A was on a search and destroy mission in the swamps along the Oriental River west of Saigon, when one of the soldiers detected four Viet Cong in a tunnel. As they surrounded the tunnel mouth a VC threw out a grenade. Padilla grasped it and threw it away seconds before it exploded. Then he rushed the entrance firing and throwing grenades. A VC threw one grenade back out. Unable to reach it in time, Padilla threw two other soldiers to the ground to protect them from the blast. He received shrapnel wounds but again rushed the mouth, this time disabling the enemy with smoke grenades. Then, less than three weeks later, the company was pinned down by heavy enemy fire soon after the beginning of a combat assault. Padilla crawled ahead 30 meters under fire, jumped up, and charged a Viet Cong weapons position. He killed two VC and completely destroyed the position. A second enemy position drew the attention of the "one man squad." He rushed across a canal, and killed two more VC with grenades and rifle fire. The position contained several pounds of Viet Cong documents. "I was all alone on the hot landing zone," said PFC Thomas McGilvary. "I turned around and no one was there. The helicopters were thirty feet above me and still going up." 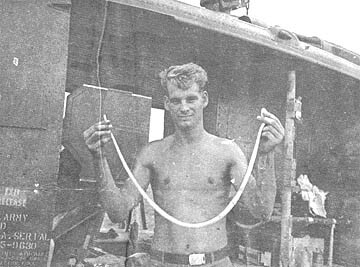 McGilvary, a radio operator with the 3rd Pit of Co A, 2nd Bn, 27th Inf "Wolfhounds," was taking part in a combat assault on a suspected Viet Cong troop concentration 32kms southwest of Cu Chi. "The choppers began taking enemy sniper fire as soon as we came near the LZ," said McGilvary, "they all came to a hover about ten feet off the ground so I figured this time they wouldn't go all the way down." "I felt a nudge from my platoon leader so I jumped out and began charging the hedgerow. Then I realized there was no one with me." The helicopters had been ordered to another landing zone at the last minute. The pilot finally realized he was short one passenger when he was about sixty feet up and immediately swung around to pick up the "one man assault." When you're slogging through a waist deep rice paddy, don't try crossing the calm spot in the center. That's the advice of PFC Lawrence Reyman, a rifleman with Co C, 2nd Bn, 27th Inf "Wolfhounds." Reyman was on a combat sweep, part of the 2nd Bde's Operation "Kolekole," when his unit came to the paddies. "I saw the clear spot but I didn't think anything of it," he said. One step later Reyman was doing the dog paddle for all he was worth in a 20 foot deep irrigation well. In the swim back to shore he dropped his rifle and steel helmet. The "Wolfhound" company watched as Reyman removed his dripping field gear and dove for lost equipment. "I had a little trouble finding it," he said, "but the swim sure felt good." The sweep continued with one very wet soldier keeping a sharp eye out for clear spots. A VC dinner table complete with steaming rice and freshly cooked chicken led Co A of the "Manchus" to a hot but successful fire fight. The Tropic Lightning troopers came across the food while on a sweep 32 kms northwest of Cu Chi. Only a hundred meters from Co A of 4th Bn, 9th Inf, one VC was spotted running westward from the meal toward a heavy woodline. The men opened fire and the VC dropped. After the brief fire fight, the 25th Inf. Div soldiers came under heavy sniper fire. Gunships were called in and raked the enemy positions with machinegun fire. What Sort Of Man Reads TLN? SP4 Carl Parker from Lake Charles, La. is constantly amazed at how many things can go wrong with one small helicopter. He is crew chief of an H-23 Light Observation Helicopter for the 2nd Bde Avn section, and it's his job to make sure all those things are fixed. After ten weeks of intensive schooling on the "bird" at Ft. Rucker, Ala., Parker began his tour in Vietnam. Could he fly the ship if he had to? Parker explained, "I've worked on it for the last nine months and know it inside and out. I could probably fly one, but it would really have to be a crisis." Recently two soldiers operating a "silent sentry" radar set spotted six guerrillas about 600 meters in front of their bunker line. When the guerrillas moved in close, the bunker guards opened up on them, driving them off. The next day a reconnaissance patrol discovered patches of blood, indicating the Viet Cong had suffered casualties. At the time of discovery, visibility was very poor. It was drizzling slightly and there was no moon. Every night two radar teams are sent to guard forward fire support bases, while two teams remain in the 25th Inf Div base camp. Each team that is left in camp is responsible for a sector of the perimeter. They have the advantage of being able to see more and further than the men in the observation posts and night ambush patrols. For example, they are able to pinpoint vehicle and troop movement with great accuracy. They are also able to make fine distinctions as to what is moving. They are able to detect the differences between such things as water buffaloes and oxcarts. 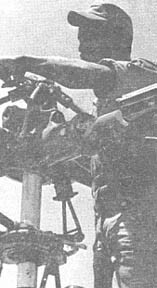 "The VC know that there is something watching them, and since my radar teams have been in operation, VC probing actions at the Cu Chi base camp and the fire support base have been reduced greatly," remarked radar section leader SSG Edward Horner of Appalachia, Va., who is the radar section leader. "The Viet Cong are beginning to learn that even though they may be in an area that is a great distance from the perimeter, where there are no troops, he can be hit suddenly by accurate mortar or artillery fire," added Horner. "My equipment is very versatile, it is light, waterproof and very durable. This is so necessary for the humid weather here. As the equipment is operated in the field it must be able to withstand dust, mud, wind, and rain," stressed Horner. Horner later remarked, "It is remarkable how maintenance free my equipment is, it enables me to better utilize my men. "This contributes to the very high moral of my men. They know that they can do a much more effective job if their equipment is working," concluded Horner. PFC Jerol F. Burr of Chicago, Ill., who has recently been assigned to the radar unit, stated, "My job as a radar operator is real challenge and a great responsibility. We have to be constantly alert while on the set." This alertness, responsibility and challenge symbolizes the aims and the operation of the radar units. It allows them to complete their mission of providing early warning for the men of the base camp. Two Viet Cong soldiers had their Saturday bath rudely interrupted recently when they were spotted in a water-filled bomb crater near the Boi Loi Woods northwest of the 25th Inf Div base camp. The frolicking bathers were having such a good time that they failed to see a 25th Avn Bn "(Huey)" helicopter hovering high overhead. Co-pilot WO Randy Cartier, Baltimore, Md., dropped the chopper down for a closer look. When the VC finally saw the Huey, they first tried to play possum, then decided to go for their weapons. 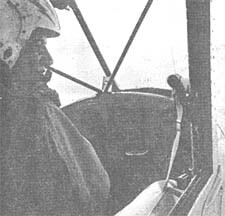 Pilot CWO Phil Timlin, Eaton Rapids, Mich., gave the order to fire, and the helicopter's door gunners opened up with their machine guns, killing both VC. SP4 Richard Oglesby, Oakland, Calif., one of the gunners, said that these two VC made a total of 18 confirmed enemy killed by the "Little Bears" this month. CPT Brian Loy of Houston, Tex., had seen a lot of Texas trick shot acts where things were shot out of people's hands, but he never thought he'd be a part of one. Loy, the artillery liaison officer for the 1st Bn, 27th Inf "Wolfhounds," had just finished a conference with the battalion commander at the night combat base. "I was lifting my steel pot to put it on my head when a burst of machinegun fire from a Viet Cong sniper blasted it out of my hands," said Loy. Everyone in the conference hit the ground and no one was hurt. Returning fire silenced the sniper. An elusive snake, slithering around the controls of a helicopter, prompted a 25th Div aircraft commander to radio in that as far as he was concerned, his aircraft should be grounded. While flying a mission for the 25th Avn Bn, CPT Thomas Fickle of Meeker, Colo., felt a snake crawling across his right foot. Pilot WO George Harrison of La Grande, Ore., took over the controls allowing Fickle to rid himself of the snake. Moments later Fickle regained the controls of the aircraft, because it was Harrison's turn to chase the four-foot long snake from his feet. As the aircraft neared Ben Hoa, the snake "broke contact" by slithering under the floor plates. After landing, the crew removed all the inspection plates from the fuselage, found the snake, but couldn't reach it because of all the small compartments. Fickle resumed the flight, and while over Long Binh, the snake reappeared by poking its head out of an opening in the left door. 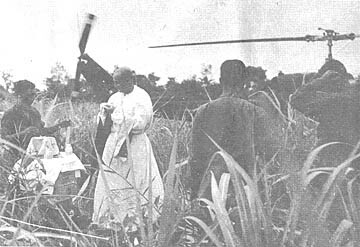 At this point Fickle radioed to battalion operations stating, as far as I'm concerned this aircraft is down," and immediately returned to the Cu Chi Airfield, where they picked up another helicopter. Ground crew personnel worked four hours with tools, aerosol sprays, and fire extinguishers before capturing and destroying the snake. LONG BINH - On March 15, 1966, II Field Force Vietnam was established as a tactical headquarters controlling all combat units of the Free World Forces in the Vietnamese III Corps Tactical Zone. During its first year in Vietnam, II Field Force conducted four multi-division operations: "Attleboro, Cedar Falls, Junction City" and "Manhattan." It is a lineal descendant of the X.XII US Army Corps, which was activated in January 1944. During the latter stages of World War II, the Corps earned two battle streamers for participation in the campaigns of the Rhineland and Central Europe. At the close of World War II, the XXII Corps was inactivated. In January 1966, at Fort Hood, Texas, the Corps was reactivated and the name changed to II Field Force. Since its organization on March 15, 1966, II FFORCEV has assumed operational control of the following major combat units: 1st Australian Task Force, 1st Inf Div, 3d Bde of the 4th Inf. Div, the 9th Inf Div, the 11th Armored Cav Reg, the 173d Abn Bde, the 196th Lt Inf Bde, the 199th Lt Inf Bde, the 25th Inf Div, the 23d and 54th Arty Grps, the 12th Avn Grp, and the 2nd Bn of the 34th Armor. The 10,000-square mile area includes 231 miles of border with Cambodia and 137 miles of coast line on the South China Sea. The elevation varies from 0 to 5,000 feet and physical features include mangrove swamps, flooded rice paddies, flat land, heavy tree-canopied jungle to heavy jungle-covered mountains. The mission of II FFORCEV is to conduct military operations in support of the Republic of Vietnam in this vast area of geographical contrasts.